The condition require detailed examination because of the proximity of other medial structures that may mimic Medial Epicondylitis. Exclusion of other etiologies of medial elbow pain is important for appropriate treatment. Medial Epicondylitis is less common than tennis elbow, occurring at a ratio of 1:15. Repetitive trauma resulting in microtears is a causative factor. Throwing athletes who have repetitive valgus stress on the elbow and repetitive flexor forearm musculature pull develop an overuse syndrome that affects the medial common flexor origin. Flexor-pronator tendinitis is a weight training ailment. In doing curls, the elbow flexors are the prime movers, but the wrist flexors must also resist the force of gravity throughout the lift. Occupation that require repetitive and strenuous forearm and wrist movement like carpentry. Tennis, racquetball, squash, and throwing often produce this condition. The serve and forearm strokes are the most likely to bring on pain. Pain on the inner side of your elbow. Pain may extends along the inner side of your forearm. Stiffness Elbow may feel stiff, and it may hurt to make a fist. Weakness in hands and wrists. Numbness or tingling. Many people with Golfer's elbow experience numbness or a tingling sensation that radiates into one or more fingers — usually the ring and little fingers. Point tenderness over or just distal to the medial humeral epicondyle. More localized tenderness compared to lateral epicondylitis. Pain with resisted wrist flexion. Tenderness over the muscles of volar forearm. Pain with passive stretching of wrist flexors. Golfer's elbow is usually diagnosed based on your medical history and a physical exam. An X-ray can help the doctor rule out other possible causes of elbow pain, such as a fracture or arthritis. Rarely, more comprehensive imaging studies — such as magnetic resonance imagining (MRI) — are done. It is extremely important to differentiate Golfer's Elbow from UCL (ulnar collateral ligament) rupture and instability. 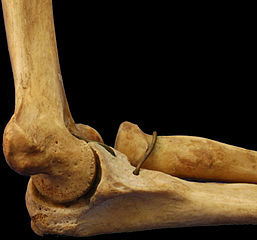 In the later valgus stress test reveals UCL pain and opening (instability) of the elbow joint. Concomitant ulnar neuropathy at the elbow may be present with either of these conditons. Tinel sign is positive at the elbow (cubital tunnel) with chronic neuropathy. Other causes of medial elbow pain to be considered are osteochondritis dissecans of the elbow and osteoarthritis. While the examiner palpates the patient's medial epicondyle, resisted wrist flexion and pronation is done. A positive sign is indicated by pain over the medial epicondyle of humerus. The area of the ulnar nerve in the groove between the olecranon process and medial epicondyle is tapped. A positive sign is indicated by a tingling sensation in the ulnar distribution of the forearm and hand distal to the point of compression of the nerve. Non-operative treatment of Golfer's elbow is similar to that of tennis elbow and begins with modifying and stopping activities that produce tension overload, the underlying etiology of Golfer's elbow, and correction of training errors (overuse) and throwing mechanics causing the tension overload. Cryotherapy- Icing and NSAIDs are used for control of edema and inflammation. Avoid painful activity-Such as gripping. Improve flexibility. Increase muscle strength and endurance. Increase functional activities and return to function. Emphasize concentric-eccentric strengthening. Concentrate on involved muscle group-Wrist flexor-extensors, Forearm pronator-supinators, elbow flexor-extensors. Initiate shoulder strengthening (Rotator cuff). Continue use of cryotherapy after exercise or function. Initiate gradual return to stressful activities and previously painful movements. Improve muscular strength and endurance. Maintain/enhance flexibility. Gradual return to sport (high level activities). Continue to emphasize deficiencies in shoulder and elbow strength. Gradually diminish use of counterforce brace. Equipment modifications (grip size, string tension, playing surface). Cortisone injection ( 0.5 ml of betamethasone) into the area of maximal tenderness may be useful, but should be given no more than 3 injections per year and no more frequently than every 3 months. Surgical intervention for golfers elbow may be indicated for symptoms that persist longer than 1 year. 1. Woo SL-Y, Buckwalter JA, ed. Injury and repair of the musculoskeletal soft tissues. Park Ridge, IL: American Academy of Orthopaedic Surgeons, 1988. 2. Curwin S, Stanish W. Tendinitis: its etiology and treatment. Lexington, MA: Collamore Press, 1984.